The eye has two main areas which are filled with different substances. The anterior segment (front) which constitutes about 20% of the area is filled with a clear watery fluid know as the aqueous humor. It lies between the cornea and the front surface of the lens. The posterior segment (back) which accounts for the remaining 80% of the internal area of the eye is filled with a clear gelatinous substance known as the vitreous humor. It lies between the back surface of the lens and the retina. The pressure within the eye is known as the intraocular pressure (IOP). It varies between 12 mmHg and 20 mmHg with an average pressure of 15 mmHg. The fluid that constitutes the aqueous humor is constantly being produced and drained in the eye. The ciliary body secretes this fluid into the posterior chamber of the anterior segment of the eye, between the front of the lens and back of the iris as explained under the human eye. The fluid then flows through the pupil to the anterior chamber where it is drained by the trabecular meshwork and then the Schlemm’s canal. This is a small drainage point that lies at the junction of the cornea and front surface of the iris. From here the fluid drains into veins and joins the rest of the venous circulation. 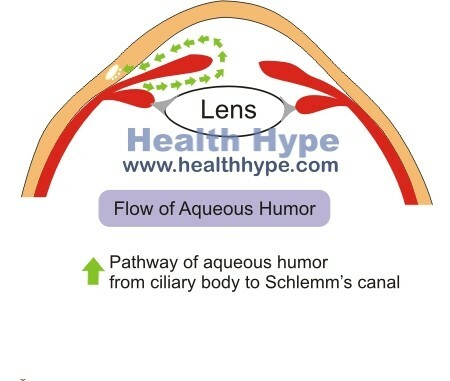 If the normal drainage is hampered for any reason, there will be an excess of aqueous humor fluid which increases the intraocular pressure (ocular hypertension). Glaucoma is a group of eye disorders associated with damage of the optic nerve most often due to raised intraocular pressure (‘high eye pressure’). Patients with normal or even low intraocular pressure can also develop glaucoma (also known as normal-tension or low-tension glaucoma) which is not uncommon. Glaucoma can occur with intraocular pressures exceeding 21 mmHg, particularly if the pressure remains above 25 to 30 mmHg for prolonged periods. Raised intraocular pressure arises when the the outflow of the aqueous humor is obstructed. The ciliary body continues to secrete normal amounts of fluid which accumulates in the anterior segment of the eye. Obstruction may be a result of increased resistance to outflow with congestion in the trabecular meshwork. This is known as open angle glaucoma because the junction between the iris and cornea where the trabecular meshwork and Schlemm canal is not physically obstructed. If there is a physical obstruction in the area, usually by the peripheral portion of the iris, then the aqueous humor cannot be drained and this is known as angle-closure glaucoma. Open angle glaucoma and angle-closure glaucoma can be classified as primary or secondary. Primary open glaucoma arises for unknown reasons and the pathogenesis is also unclear. It appears to be related to mutations in the MYOC gene which codes for myocilin, a protein that in present in certain tissues including the trabecular meshwork. Primary angle-closure glaucoma occurs when the margin of the iris obstructs the drainage pathway as illustrated in the diagram above. The exact reason why this occurs is not always clear. 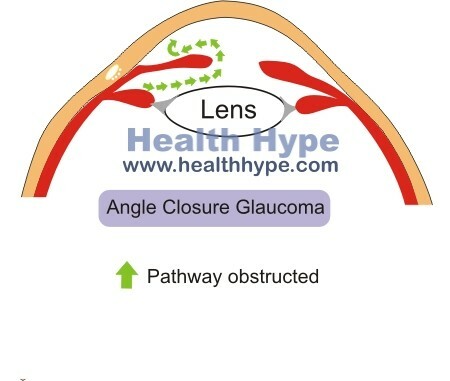 Secondary angle-closure glaucoma is a result of physical obstruction by particles, fibrotic scarring or abnormal growths that compress and thereby clog the trabecular meshwork as is seen with conditions like neovascular glaucoma. Sometimes the exact cause, particularly with primary types of glaucoma, is not always known but several risk factors have been identified. Glaucoma is one of the common causes of blindness. This arises with damage to the optic nerve often as a result of axonal compression with raised intraocular pressure (‘high eye pressure’). Signs and symptoms of glaucoma may vary depending on the type of glaucoma. Patients with open angle glaucoma do not have any symptoms initially until loss of vision sets in which progresses gradually. With angle-closure glaucoma, the symptoms are intermittent at first and then becomes permanent and gradually worsens. Open angle glaucoma presents with gradual loss of vision and noticeable loss of peripheral vision (tunnel vision) in later stages. It usually does not present with eye pain.